Tommy Eveld, Weston Wilson and Andrew Schwaab all proposed to their respective girlfriends before games during the 2017 season. Andrew Schwaab sat alone in the dugout, staring at the rain. With the rest of the Florida State League's top players in the clubhouse, the Yankees pitching prospect just watched it come down, worried about what was going to happen. But it wasn't his opportunity to play in an All-Star Game that had Schwaab fearful of a cancellation. It was what he'd planned beforehand. Like Brewers prospect Weston Wilson and D-backs prospect Tommy Eveld had done a month prior, Schwaab was set to propose to his girlfriend after she threw out a ceremonial first pitch. As if following a movie script, the clouds parted, the rain stopped and Schwaab was able to get on bended knee to pop the question to Lauren Stoeckle, who -- of course -- said yes. While it was a special moment, the time before and after hasn't always been idyllic, with more conversations on FaceTime than face-to-face. But it was always worth it. "Being on the road and going through this with your partner and not seeing them for so long and then being there for them when they have a bad outing or even when they have a good outing, you have to be prepared to be on the other end of it, which is our hardest role as fiancés, girlfriends," Stoeckle said. "As their supporters, we have to get through a lot together. I think baseball players have it pretty tough, but the baseball girls have it tough as well." A month after the June 17 proposal, Schwaab gave Stoeckle another big surprise at a stadium. With his sister and brother-in-law in town, the 24-year-old called his fiancé back to the field. Stoeckle walked down the steps at George M. Steinbrenner Field to the barrier, "because, let's be honest, there's always that wall between us and them when they're on the field." That literal separation was about to get much bigger as Schwaab informed Stoeckle and his family that he was being promoted to Double-A Trenton. "I had no thoughts in that moment. It was pretty surreal, but he had absolutely deserved it. It was a good moment," she said. "It was [tough], just because we were still on our engagement high and I wasn't really prepared to let him go again because I didn't know when I was going to be able to see him again." Schwaab and Stoeckle had gotten used to being apart. While they met in a communications class at the University of Missouri, the latter transferred to the University of Arizona for the swim team about a month and a half into the relationship. The pair planned FaceTime dates to watch Netflix together and catch each other up on their days. Stoeckle tuned in to watch Schwaab pitch for Mizzou and, eventually, the Yankees after they signed him in June 2015. When Stoeckle graduated in 2016, she moved to Seattle for an account coordinator position in sales and marketing. That fall, Schwaab joined her and began their longest stretch of living together. The right-hander predicted he would be in the Florida State League for most of 2017, so Stoeckle got permission to work remotely as the pair moved to Tampa for Spring Training. "It's actually really nice because normally we would go a month or two without seeing each other and then we would only visit for like maybe a week and then go another few months," he said of finally getting together. "So it was tough battling that for a while." Weston's high with his now-wife Madison also got cut short when he was sent down from Class A Advanced Carolina to Class A Wisconsin on June 22, seven weeks after the proposal. Getting the news while on a beach during the All-Star break, the 23-year-old and his fiancé were taken aback. "I would've married him the day that I met him, and I'm not like that. But I knew it right away, so I was very happy that he did, but I was so nervous," Madison said with a laugh. "I remember seeing the camera guy in my peripheral vision, so close to my face and I was trying not to cry and I couldn't even breathe. But I was so happy." While Weston was in Wisconsin, Madison put her modeling career on the back burner and began planning with her mom and future mother-in-law. The Brewers prospect felt bad he couldn't participate but knew his then-fiancé understood the circumstances. The demotion in the middle of wedding planning may have led to a tough adjustment as Weston went hitless in his first four games with the Timber Rattlers as part of a 6-for-31 (.194) stretch. That's when the Clemson product had to remind himself why he deals with the slumps and the distance from loved ones. "I just had to put things in perspective. Like baseball is what I'm doing, but it's for a greater purpose," he said. "I'm always thinking about Madison and the family that we're going to have one day. We are a family right now, but providing for our kids and just looking forward to that." Eveld and Erica Nunn had a system when they first started dating. He was on the football team and she played softball at the University of South Florida. With the opposite seasons, they could attend each other's games. Then Eveld switched to baseball his junior year and things got complicated. While their schedules didn't match up, their stadiums were right next to each other, so Eveld would catch a few innings of softball before his game started and Nunn could watch the end of the baseball games. "We were just so busy with practice and games that I didn't really think of it that much," she said of the time apart. "But whenever we had off days, we would always hang out. I guess that's where we got our first taste of it." Eveld was drafted by the D-backs in 2016, while Nunn went to North Carolina State for grad school. Crossing time zones, Nunn stayed up late to watch Eveld pitch for Class A Short Season Eugene, noting that she had to watch the whole game since he was the Emeralds' closer. The 6-foot-5 right-hander said he doesn't worry about the distance, noting it wouldn't matter if he was in the Carolina League or Japan. "We're pretty happy with what we got," he said. "I guess I'm just thankful that we don't have the hiccups and that she understands what the Minor League life is." Getting a stable job at a software company in North Carolina after grad school, Nunn focuses on the fact that the season runs only from February to September. Admitting she's become much more of a planner with their lifestyle, the former All-American softball pitcher has learned how to buy redeemable flights and use vacation days strategically as midseason promotions can happen when you least expect them -- like six weeks after a proposal. "He loves it. I don't think he's ever been mad or sad when he's out during the season," she said. "He always have a positive attitude, is always willing to work and do the extra stuff to get him to where he wants to go. That's what makes it worth it." With her softball background, Nunn not only understands her fiancés passion, she understands pitching. "I lucked out. I'm fairly new to the more advanced type of baseball with all the film studying and just learning the game, and she's got a couple years of that under her belt already from being at USF," Eveld said. "She'll actually call me sometimes and talk baseball with me and be like, 'Hey, what were you thinking when you were throwing to this guy? Why did you throw this pitch there and why weren't you thinking … maybe you should've thrown your curveball instead of fastball again.' She can give me pointers and advice that it's almost like having another pitching coach." After an offseason enjoying married life for the Wilsons and planning their upcoming nuptials for Schwaab and Stoeckle, and Eveld and Nunn, the 2018 season figures to bring back old challenges. Madison will continue modeling in Los Angeles or Miami, while Weston heads to Carolina or Double-A Biloxi; in April, Stoeckle will move to Denver for work and finalize wedding plans while Schwaab likely will be in Trenton or Triple-A Scranton/Wilkes-Barre; and Nunn will keep working in North Carolina while Eveld plays for Class A Advanced Visalia or Double-A Jackson, which would be a nine-hour drive from his fiancé and family. "It's easy to make it work because our relationship is so strong," Madison said. "It's just hard to be apart because I don't like to be away from him." Thinking about the keys to making things work, communication, trust, understanding and love came up a lot, of course, with commitment being the underlying factor. "If he wasn't committed to the sport the way he is, he wouldn't be doing it, he wouldn't be where he is, he wouldn't be as successful as he is," Stoeckle said of Schwaab. "If we weren't committed to each other, we wouldn't be suffering the distance, we would've definitely chosen a different path because this is not for the faint of heart, this entire lifestyle. So I definitely think commitment and just loving each other is probably the best key to it all." 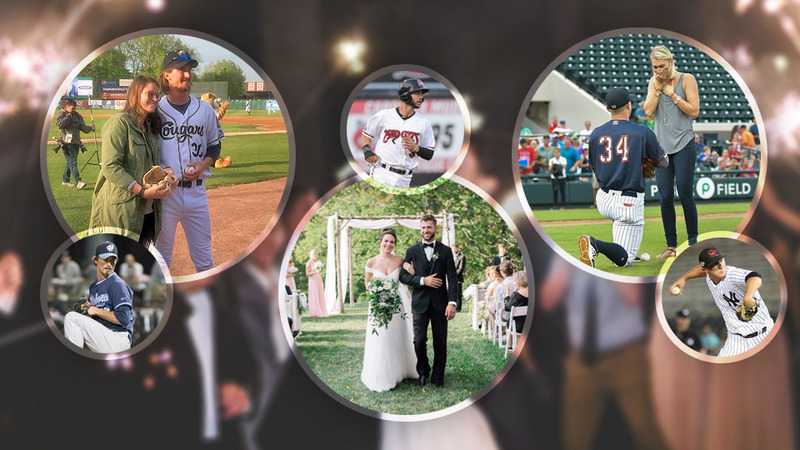 While Valentine's Day is viewed as commercial by some, it also marks something Minor League couples don't take for granted. With college opening days and Spring Training report dates usually falling on or before Feb. 14, they're typically separated. Occasionally, however, things work out: with Stoeckle still in Tampa, she "actually" gets to be with Schwaab for the second Valentine's Day in a row. "I don't know about next year or the year after that, but I'm going to take this one for what I can and we're going to enjoy it," she said. "I'm not sure what we're going to do, but I know we'll just enjoy being together."